Keeping it country! The 2016 CMA Awards celebrated both legends and newcomers to the country music scene at Nashville’s Bridgestone Arena on Wednesday, November 2. 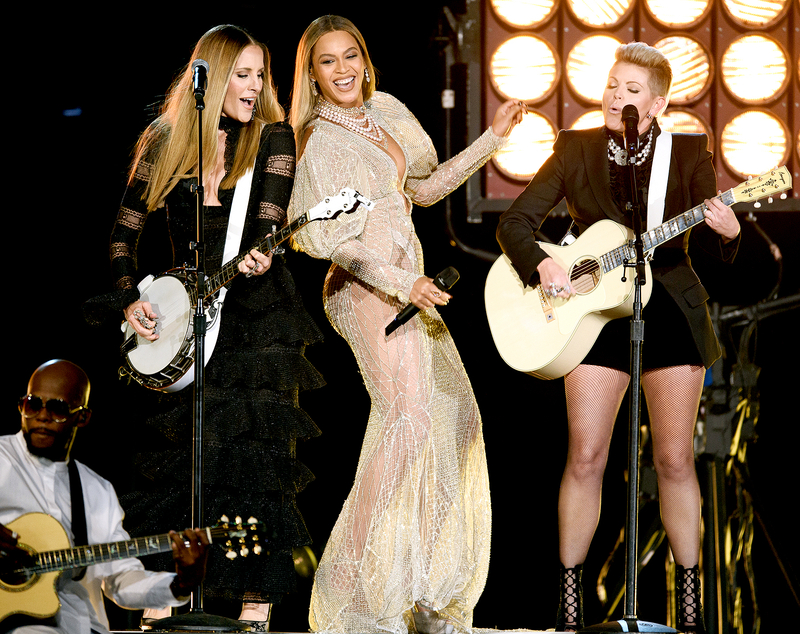 In case you missed it, Beyoncé stole the show with an epic Dixie Chicks collaboration, Taylor Swift made a surprise appearance and Miranda Lambert and more stars ruled the red carpet. Watch the top moments of the night in the video above, and Us Weekly answers all your questions about this year’s CMAs below! Who were the best-dressed stars on the red carpet? Host Carrie Underwood stunned in her first dress of the evening, a blush pink Michael Cinco gown embellished with hundreds of Swarovski crystals and pearls. Kacey Musgraves looked like a princess in a custom pale lavender tulle gown by Christian Siriano, while Kimberly Williams-Paisley made us green with envy in an emerald Rubin Singer gown accessorized with a 20-carat Johnathon Arndt yellow diamond that was later transformed into a pin worn by her husband, Brad Paisley, during his hosting duties. Miranda Lambert and her boyfriend, Anderson East, were the It Couple on the carpet, with the “Gunpowder & Lead” songstress rocking a low-cut, edgy black Georges Hobeika gown and Monika Chiang heels. Hosts Underwood and Paisley took a stab at comedy and mocked the presidential election by poking fun at Donald Trump and Hillary Clinton in their opener. “The people need to know: Will you accept tonight’s results?” the American Idol alum asked Paisley. “Yes. If I win,” the “Whiskey Lullaby” crooner said, à la Trump, before Underwood reminded him he wasn’t even nominated. Randy Travis, who suffered a life-threatening stroke in 2013, gave a short but emotional performance of the last lyric in his 1987 smash hit “Forever and Ever, Amen.” The country singer was unable to walk or even speak just a few years ago, but he’s made huge strides in his recovery and earned a standing ovation from the Nashville crowd. Taylor Swift kept her appearance at the CMAs totally under wraps, so everyone was excited to see the pop superstar return to the CMAs stage for the first time since 2013. The “Shake It Off” singer presented Garth Brooks with the Entertainer of the Year award and gave a short speech about moving to Nashville 13 years ago before giving the award to the country music icon. Who took home the night’s biggest award? 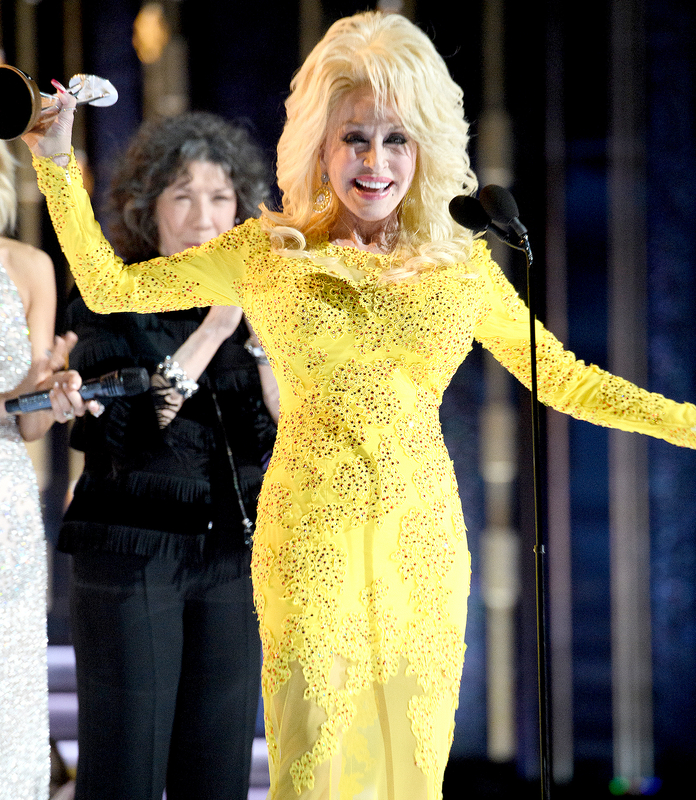 Dolly Parton was honored with the Willie Nelson Lifetime Achievement Award, and multiple stars paid tribute to the iconic songstress. Jennifer Nettles and Pentatonix performed “Jolene,” Reba sang “9 to 5” and Kacey Musgraves belted out “Here You Come Again” — to name just a few of Parton’s hits that were covered throughout the night. Which non-country superstar ruled the night? Beyoncé! The pop superstar collaborated with the Dixie Chicks on a rendition of her country song “Daddy Lessons” off her visual album Lemonade. The performance stunned attendees (Matthew McConaughey was dancing along in the audience) and fans at home (Reese Witherspoon tweeted her praise). What other unexpected guests attended? Jennifer Garner, who looked sleek in a strapless Jenny Packham gown, presented New Artist of the Year to Maren Morris and reminisced about her Southern roots and growing up in West Virginia. Season 11 Bachelorette Kaitlyn Bristowe served as a red carpet correspondent for Sounds Like Nashville and turned heads in a lacy crop top and voluminous black skirt. And last but not least, the Final Five gymnasts reunited for their first public appearance with all five athletes since the Rio Olympics. The ladies presented Thomas Rhett with Single of the Year and reminded us why they’re America’s sweethearts.